Ham, sooo nice to eat and generally loved by the whole family. But for a family - too expensive, right? Wrong! That picture is of a Ham Bone. This can be purchased for $3 – $5 from the Deli section of most supermarkets. 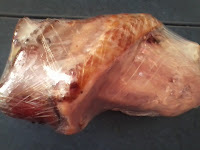 There is a lot of meat on the ham bone and this can be utilized in a variety of ways. I purchased this for $3.00 from the Deli of my local Countdown supermarket. PET FOOD - Add rice and mixed veges for a healthy meal your dog will love! BACON for a Full Breakfast for as little as $2.00 per breakfast! HAM SLICES for salads, omelettes, sandwiches - anywhere you would use regular Deli Ham Slices. ALL THIS FROM A DELI HAM BONE !!! WHOLE Ham Bone – simply use in this recipe as you would a bacon hock. You will get the same delicious meal for half the cost. Vegetables - use whatever you have at home - older veges work well and saves throwing them out. Boiling water ( 9 cups or 2 lts approximate - you need enough water to cover ham bone and veges. 1. Boil jug/kettle so it is boiling while you chop vegetables. 7. Reduce heat to low, cover, and cook slowly for 2-3 hours, stirring occasionally. 8. Use tongs to check when ham bone is ready. There are usually two long bones and they lift out easily when done. Turn off heat. 9. Scoop ham out, chop or shred into smaller pieces and place back onto soup. Stir well as as split peas tend to be at the bottom. Serves 4 people easily and tastes even better the next day for lunch – if there is any left over. Freezes extremely well for that microwave ' meal in a hurry' - simply re-heat and serve!